On Deviant Art aruarian_dancer created a Friday Doodle Club, because she usually drew stuff and then posted it on Friday or Saturday. There's fifty people on it now! And it's just about having fun and just drawing to draw... or whatever... so it was a good excuse for me to just paint for fun and just try stuff out that I wouldn't have otherwise tried. So one of my joys for today was the Doodle Club. Hee. With this one I crumpled the top of the paper to get the stone textures and the dry ink feeling for the lines on the mountain. It makes it lovely and jagged. The 'misty' look was done by wetting the paper after the paint was dry and then using a quick wash with a huge, flat brush with just the top corner with color to let the rest of it just be wet. The whole thing was done in about ten minutes. So it was fast and quick and fun to just do... there's a few details on the pine tree I'd like to get better the next time, but I really loved how the far-off mountain looked, though perhaps I should have mixed a little more gray into the blue. This is a piece of a painting that I trashed from a long time ago. I didn't like how the rest of it turned out so I just cut off the piece that I liked and kept that. It will probably look nice enough when it's backed, and I might put a few more flowers right above the bird just to balance it a little. All the paintings today were small, so I didn't have to worry too much about layout and how to spread things around. This was of a size with the rest, about 4"x6", or a large index card. 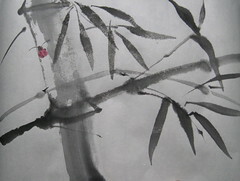 I kept thinking about a ladybug on a big stalk of bamboo, and when I painted the stalk, I was kind of impatient as it was just a small painting. I have to admit that I love my new circular ink stone. I love it way too much, and I can just put five drips of water on it and make a lovely little puddle of ink that dries around the edges so that it's good and concentrated and is still flowing in the middle. It's really fun and I love it to bits, and so I was able to just get a good, wet brush, work some of the ink into the water, and then tip with the black and paint a bit of darkness onto the bristles and make for the dark edges on the bamboo. 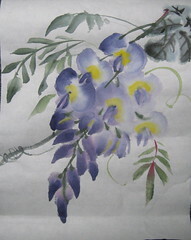 My favorite for last, as this is a little Chinese-style wisteria that I finally really got right, I think. I really liked how the white tipped with purple worked for the open blossoms, and the darker pink tipped with purple worked for the buds. The greens tipped with red for the leaves gave it a little more variety, I think, along with the stems. No big vine for this one as there wasn't quite room. It's different than the others, and almost a little too blue. Felt a little more like grapes than wisteria, in some sense, but... I dunno. It gave it a more rounded look, I think. John had made cinnamon rolls for breakfast, which I always enjoy. Around noon the sun had warmed the south side of the house enough for me to work in the vegetable garden. The raspberries from last year needed to be pruned down, so I worked on that for a while as John did a lot of other things around the yard. Then I also planted and watered spinach, lettuce, and radishes. They'll all be freeze tolerant, still, and the soil is plenty warm enough for them. That was very cool to do. I loved my gloves from Biloxi as they made it so that the very, very thorny raspberries were a cinch to prune without raking the heck out of my hands. The green onions were out, too, which was very nice, as I just cut a bunch for my ramen lunch. They were very nice, and the ramen was a godsend as the cold has gone into my nose and lungs rather than making the back of my throat feel like ground meat. The soup was really, really nice, and I've been downing a lot of herbal tea. I also got to watch the end of the Zanpakutou arc and really enjoy how it ended. The two filler episodes I got to see so far have been very... uhm... cute and a little bemusing. I am honestly confused by some if it, and amused some of the time. I like Zabimaru, though, a little more. John made dinner, and I was very grateful for fish sticks and sweet potato fries. We also had Ben and Jerry's for dessert. I also really enjoyed playing Crash of the Titans with Jet. It's the first 'fighting' Crash game, and we weren't too sure of that, but Jet and I have gotten to be really amazingly good at team fighting in the game. We've learned how to coordinate our attacks, learned to just do stuff at the same time without saying anything. It's really gotten fun to see how effective he's gotten and how quickly, and it's even more fun being effective WITH him rather than just watching him do it alone. We're communicating really well in all the small things in the game, so that works out really nicely. I am glad you had a good day. Thank you. I hope you get well, too. The paintings are gorgeous! I think my favourite is the ladybird ladybug one, but they're all beautiful. Yes! The zanpakutou arc was quite good. I rather liked how it worked out and what it revealed about the relationships between shinigami and their weapons. That's been very cool. I think a box of PG Tips, and if you can also bring some Dark Chocolate Hob Nobs as well (3 or 4 rolls? ), I'd be very, very happy. Is there something you wanted in a painting? I really love all the stuff you've been showing us, so if you're still willing, I'd like that. 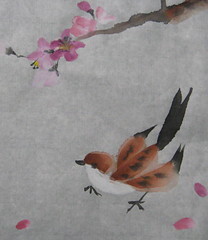 I'm particularly fond of the ones with birds and/or flowers. I'm not going to be making it to CO this time but I'm happy to carry over the tea and biscuits and ship once I get there; we should link up in email to compare notes and addresses although my livejournal.com email doesn't work any more ... hmm. If you can give me an address and target date in advance, I could mail a backed painting to you! Glad you had such a good day though. It's okay to not play favorites. It was a good day if a bit more than I should have done. 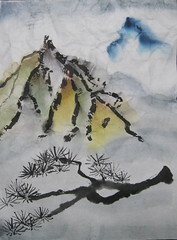 I really like how lively your paintings are; the mountain is particularly lovely. *beams* Thank you!! I'm so glad that they pleased.